Preschoolers love crafts. They love them even more when the craft becomes something to play with afterwards. 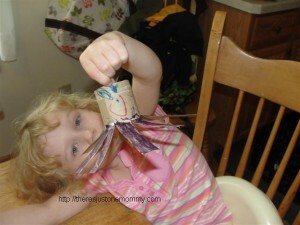 This is one reason when it comes to kids crafts we especially love cardboard tube crafts. Not only are they fun and cheap, but you can create so many fun characters to play with using those tubes. 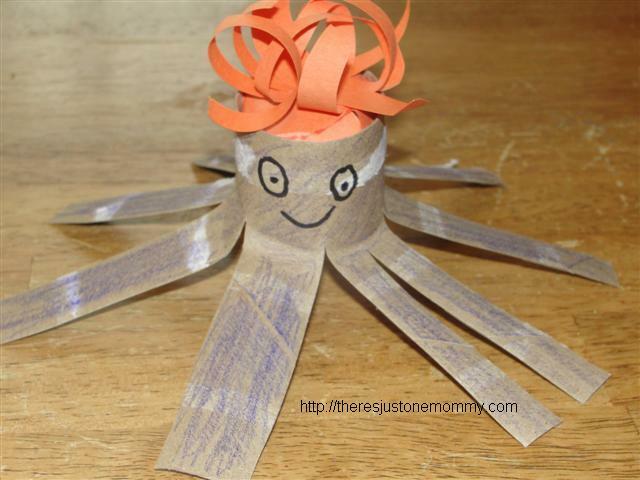 This toilet paper tube octopus is a fun preschooler craft for summer or to pair with a unit on sea animals. 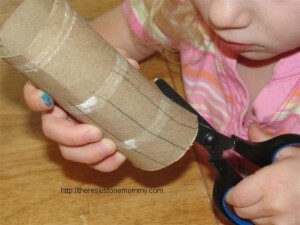 To help guide your preschooler, draw 8 vertical lines going about 2/3 of the way up the cardboard tube. Have your child use scissors to cut on the lines. 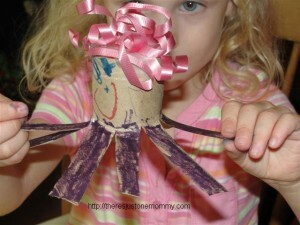 Use markers or crayons to color the legs and body of the octopus. We found that marker showed up better than crayon. You could also use paint, but then you will need to wait for it to dry before you can finish the craft. 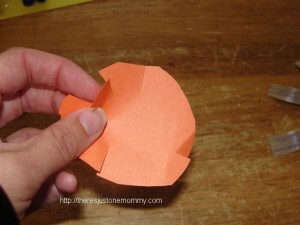 To keep the mess to a minimum have your child color on a scrap piece of paper. Have your child draw a face on the octopus. 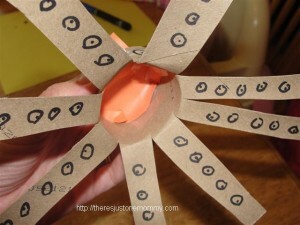 We added circles as suction cups to the bottom of all 8 legs, too. She was happy with her cardboard tube octopus. I think the ribbon hair looks much better than my original colored paper hair! As a bonus, when she finished her sea animal craft she had a new little friend to play with. 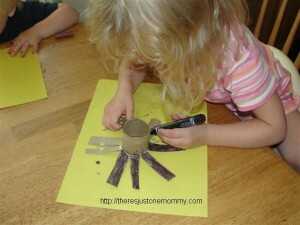 That’s the great thing about toilet paper tube crafts – you never run out of supplies! This is such a cute idea, and who doesn’t have toilet paper tubes every few days. I’ll have to save my next few and give this a try. Stopping by from The Mom Loop Friday follow. I’m your newest follower! Thanks for stopping by! I’m headed to your site now! I love its pink curls. So cute. fun! we will have to make the spider for Halloween decoration this year..
Yeah, I was thinking it would be a great Halloween decoration… But she really wanted to use that colorful sand right then. LOL. Clever! Great idea — thanks for sharing! I appreciated you dropping by Pink Dryer Lint the other day. 🙂 Your comment made me smile. What a fun project and really simple to do. Fantastic! I was going to use pipe cleaners but cutting legs is a fab idea – I’m going to make spiders – I shall pin this and link back to you, hope that is ok. This is so cute! Pinned it! Thanks for sharing at Mom’s Library! Perfect craft for tp tubes, with great results! Thanks so much for sharing on craft schooling Sunday!